Preheat the oven to broil. Line a baking sheet or roasting pan with foil or parchment paper and place the orange wedges on pan. Sprinkle brown sugar evenly over the top of the exposed fruit. Place under a broiler for 3-5 minutes, until the brown sugar is bubbly and beginning to brown and the edges are caramelized. Remove from oven. 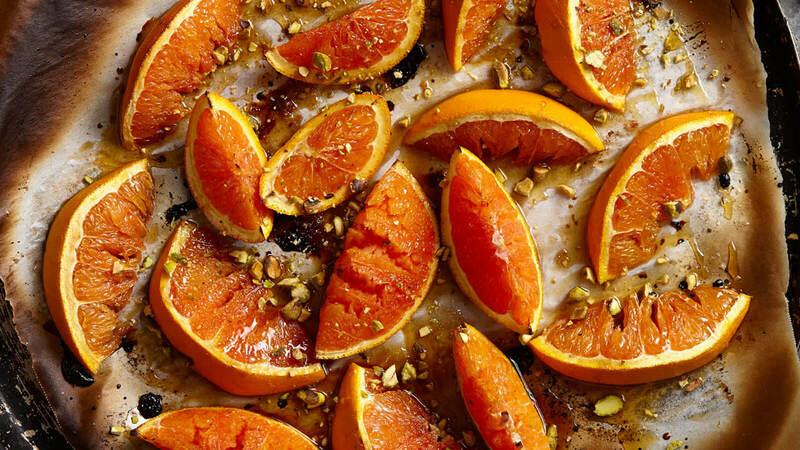 Drizzle orange wedges evenly with honey and top with pistachios. Serve warm. Delicious eaten out of hand (leaving the rid) or remove rinds and toss in a salad or serve alongside your cheeseboard.